Well, better joining the party late is better than never? Thanks again to Shazina for sending me this book as part of the #NinjaBookSwap. Cather and Wren are twins and have done everything together since they were born. Go to school, hanging out with friends and even writing Simon Snow fan-fiction. So when they go to college, this all changes as Wren makes new friends and begins to party. Cather is left behind with her room-mate Reagan and her ex-boyfriend now just friend Levi hanging around. So, what makes this book special? The fact that Rainbow Rowell took the time to build her characters and give them a clear personality that the reader can easily distinguish between them all. She also allows her characters to grow up in their personalities not keeping them in one static state, and it is all very natural unlike many authors who seem to think characters can change in a word. I can understand very easily why this book took the blogger world by storm, it is basically what we are as a group, a bunch of book obsessed people. We may not all write fan-fiction but the majority will have that series that they always pull back to, that series which epitomises their reading career if you will. It also looks at writing fan-fiction and whether it really is a type of literature, is it stealing someone’s characters and putting them into your own world? Well, just change a few names and I’m sure your favourite series could be knocked off fairly easily. Cath is socially awkward and doesn’t really understand just why her obsession with Simon Snow is, well, not normal. she clings onto this reality of the happier and easier times in her life along with the excitement of the new books being released. She has to learn that not everything can be clung onto forever and remain normal. Sometimes things just grow old and weary or become abnormal. Which, is by no means wrong but it really depends why you hold onto something so deeply, to the extent Cath does with Simon Snow. This book also calls to all those who are leaving the safety and comfort of the known, their bed, their house, their seat in the canteen at school for a bigger adventure elsewhere where there are new people to meet and to fall for. Which Cath does. 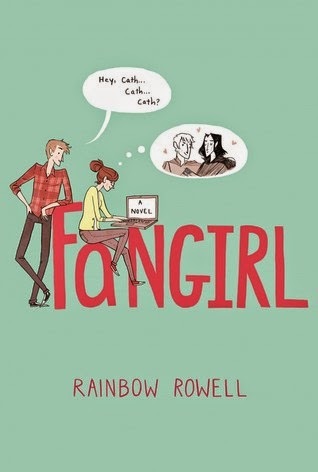 Rainbow Rowell does an excellent job of portraying all the good that comes with love as well as the bad. She also notes how friendships can be made with the most unlikely of people, and how even those who seem to be helping you may actually be hindering you. So overall, this book is an easy read which can be related to life as a whole, where even though letting go, or taking the next big step may seem hard and unlikely, sometimes it is simply the best opportunity in your life. It is a shame that some sub-plots in the beginning are forgotten but that doesn’t take away too much from the read as a whole. A nice, 4 star read. Next Post Why do I love reading?